San Giljan Salini Resort were on a rehabilitation mission after the hiding they got at the hands of Neptunes in their last match. Although they found Valletta McDonald’s team bubbling with confidence after the City team’s recent upsurge, the Saints obliged to register an emphatic 15-6 victory and thus reduce the gap from joint leaders Sliema and Neptunes to one point. With Dino Zammit back in the team, coach Marko Orlovic could bank on a wider striking force and as a consequence more options when the team had possession. Zammit was back in the reckoning with a bang when netting four goals, three of which inside the first minute of the third session. By that time San Ġiljan had already built an 8-2 advantage. More than that they had been tactically efficient when blotting Valletta’s feared striker Dmitri Kholod out of the game, never mind allowing space to Michael Spiteri Staines to inflict some damage with five goals. Meanwhile, San Ġiljan kept picking their spot regularly, mostly through their potent centre Peter Borg. He struck four times followed by Aurelien Cousin, scorer of a hat-trick. Valletta had been restricted to a damage-limiting exercise. Their opponents were unquestionably the stronger side. The first matches yesterday resulted in wins for Marsascala Nutrition Empire and Marsaxlokk Fischer who collected the points at the expense of Ta’ Xbiex Amigos and Otters Nivea, respectively, in the First Division. 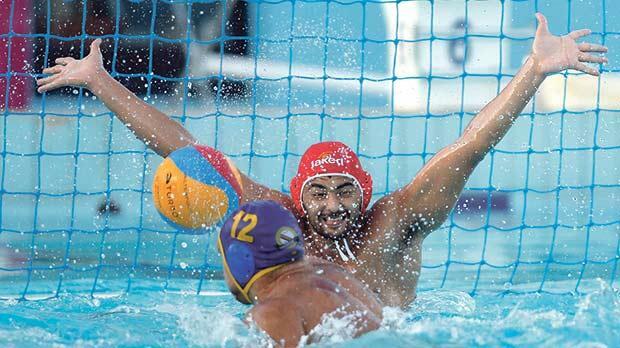 In the opening game, Marsascala won 12-9, pulling clear of Ta’ Xbiex thanks to a six-goal flurry in the last session. Marsaxlokk, parading Ivan Vuksanovic, were simply too good for Gozitans Otters. Valletta: R. Sciortino, J. Spiteri Staines, D. Spiteri, M. Rizzo, A. Mifsud, R. Mock, D. Paolella 1, N. Bonello Ghio, M. Cordina, C. Zammit, D. Kholod, A. Zarb Cousin, M. Spiteri Staines 5. San Ġiljan: J. Sammut, P. Borg 4, A. Galea, B. Vapenski 1, Darren Zammit, M. Zammit 2, K. Galea, C. Mercieca 1, B. Plumpton, A. Cousin 3, P. Fava, Dino Zammit 4, D. Camilleri. Referees: P. Balzan and V. Frauenfelder. Marsascala: K. Schembri, J.C. Cutajar 2, J. Busuttil, C. Bonello 2, J. Bajada, L. Grixti 1, G. Kovacs 4, J. Cremona, S. Micallef 2, M. Pace 1, D. Cassar, O. Zammit, B. Dougall. Ta’ Xbiex: J. Tanti, A. Maklari 4, A. Camenzuli, B. Grech, E. Meli 1, A. Sammut, M. Mifsud 4, D. Schembri, G. Attard, D. Fenech, R. Attard, J. Zerafa Gregory, J. Micallef. Referees: M. Angileri and V. Frauenfelder. Otters: R. Bonnici, M. Borg Millo 1, R. Greco, L. Hyzler 1, K. Scicluna, D. Dimech, G. Mizzi, M. Jelaka 3, L. Peric, G. Debono 1, M. Borg 1, R. Gauci, M. Xerri. Marsaxlokk: A. Xuereb, C. Spiteri DeBarro 4, L. Calleja, K. Galea 2, C. Gialanze, C. Bugeja, K. Debattista, I. Vuksanovic 5, B. Buhagiar, R. Scerri 4, K. Navarro, G. Busuttil, D. Abela. Referees: A. Goncharenko and M. Luciani.